Our large hoop earrings have a fully cast and enameled Las Vegas Golden Knights® charm with enameled detail and a high polish nickel free chrome finish and rhinestone access. Hypoallergenic fishhook posts. 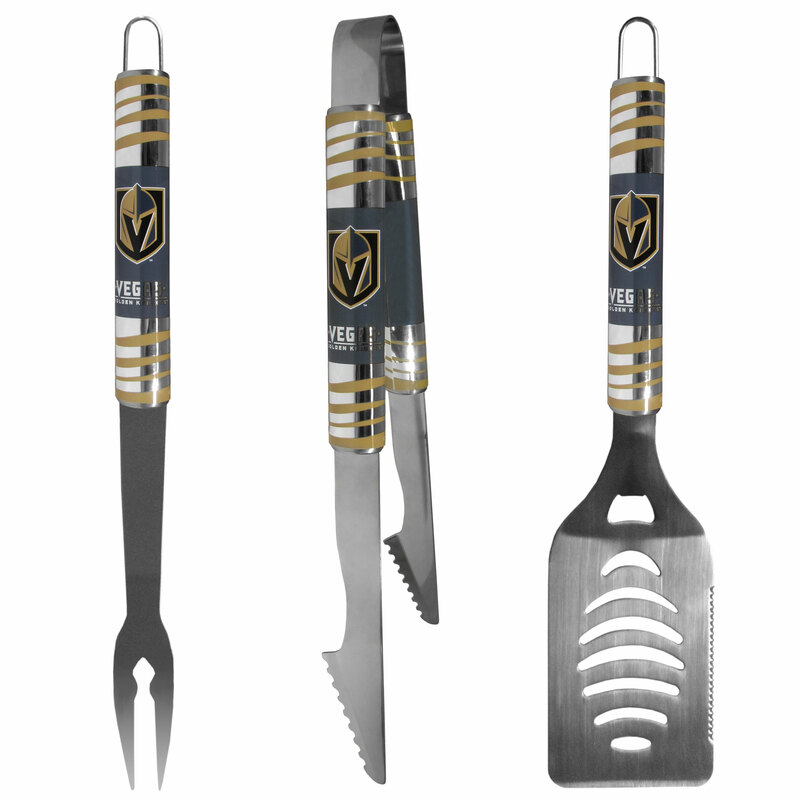 This high-quality, 420 grade stainless steel 3 pc Las Vegas Golden Knights® BBQ grill set will make any grill master smile. These barbeque tools are made to last whether you are using them for camping, tailgating or a patio party you will have quality grill tools for years to come. The set includes a large spatula with a bottle opener feature and sharp serrated edge, strong tongs and fork. The 16 inch length keeps you far from the flames. The quality of the tools make them a great choice for tailgating, Father's Day or Christmas gifts, or just everyday BBQ needs, they are really a grill accessory must have. The eye-catching chrome graphics on this set make it a game day favorite! 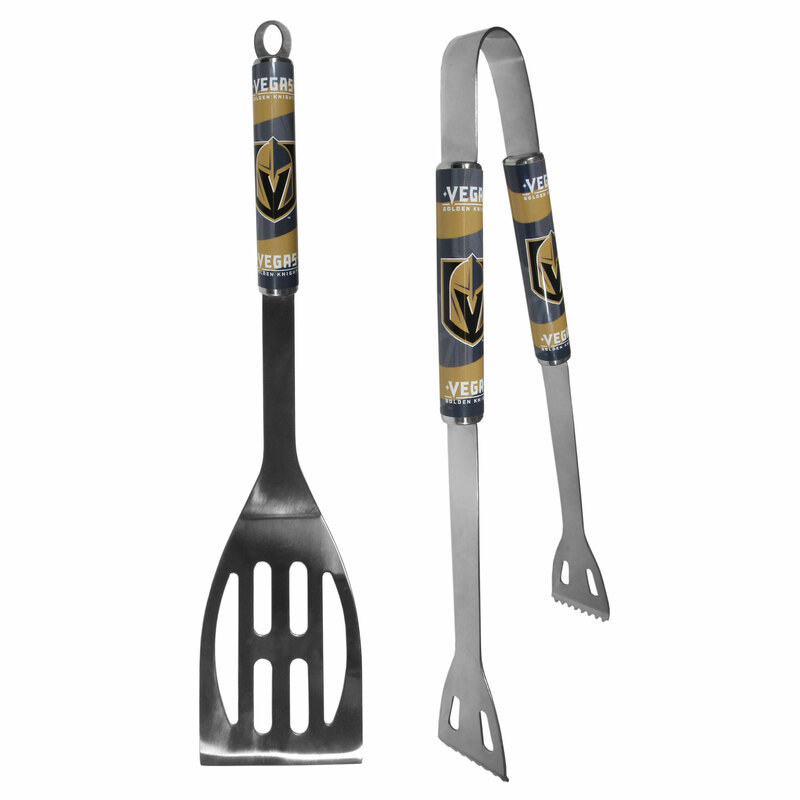 The high-quality, 420 grade stainless steel 3 pc Las Vegas Golden Knights® BBQ grill set will make any grill master smile. These barbeque tools are made to last whether you are using them for camping, tailgating or a patio party you will have quality grill tools for years to come. The set includes a large spatula with a bottle opener feature and sharp serrated edge, strong tongs and fork. The 16 inch length keeps you far from the flames. The quality of the tools make them a great choice for Father's Day or Christmas gifts, they are really a grill accessory must have. Our monochromatic steel money clips have a classic style and superior quality. 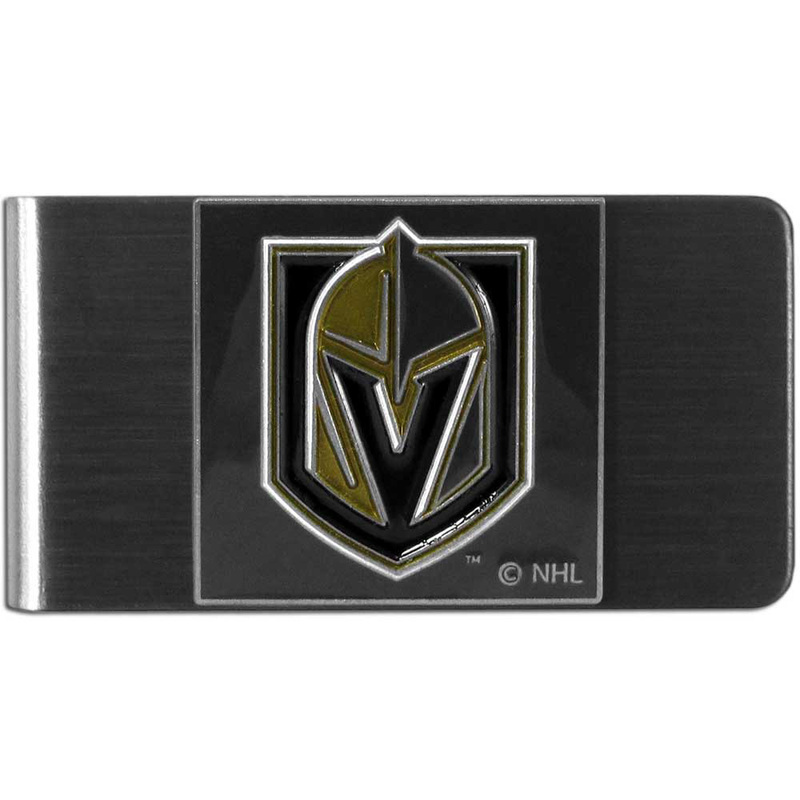 The strong, steel clip has a black overlay of the Las Vegas Golden Knights® logo over the brushed metal finish creating a stylish men's fashion accessory that would make any fan proud. Our brushed metal money clip has classic style and functionality. The attractive clip features a metal Las Vegas Golden Knights® emblem with expertly enameled detail. Make a statement with our collegiate chain necklaces. The 22 inch chain features a fully cast, high polish Las Vegas Golden Knights® pendant with vivid enameled details. Perfect accessory for game day and nice enough to wear everyday! Our classic single charm bracelet is a great way to show off your team pride! 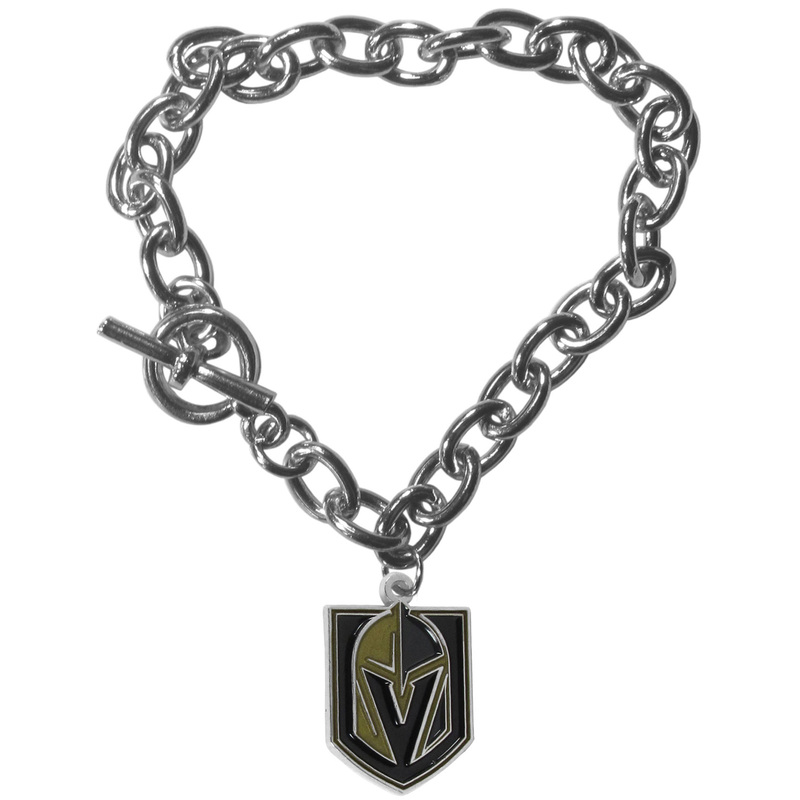 The 7.5 inch large link chain features a high polish Las Vegas Golden Knights® charm and features a toggle clasp which makes it super easy to take on and off. 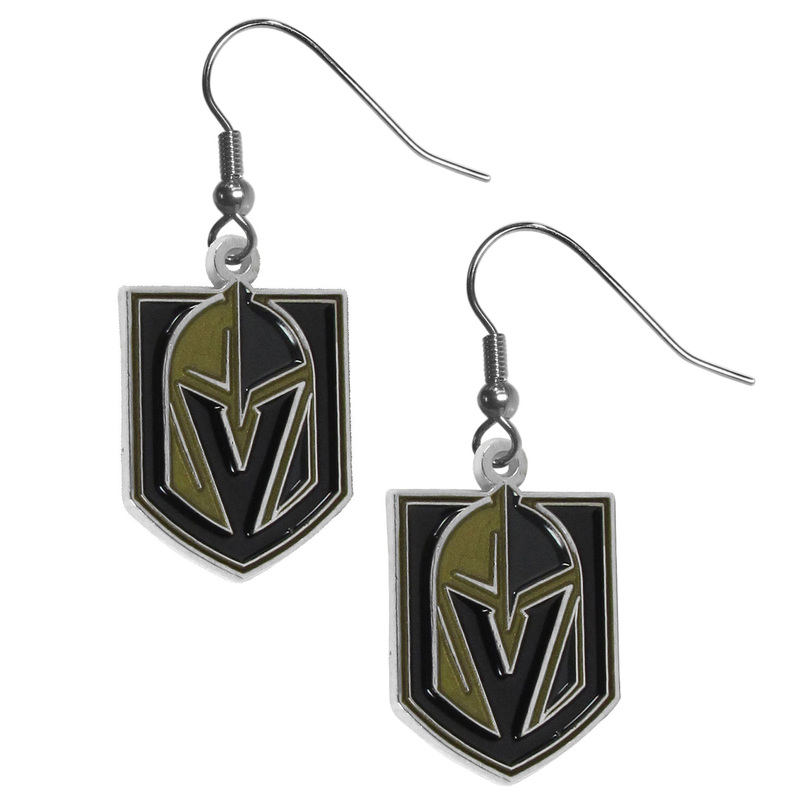 These on fleek Las Vegas Golden Knights® Dangle earrings are a lightweight and casual fashion earring with a striking team charm. These trendy understated earrings feature a carved and detailed enameled charm. Sporty meets fashion-forward with these spirited earrings that would make the perfect gift for any female fan. These trendy earrings are the perfect for every day but especially fun to glam up on game-day. Our crystal dangle earrings are the perfect accessory for your game day outfit! 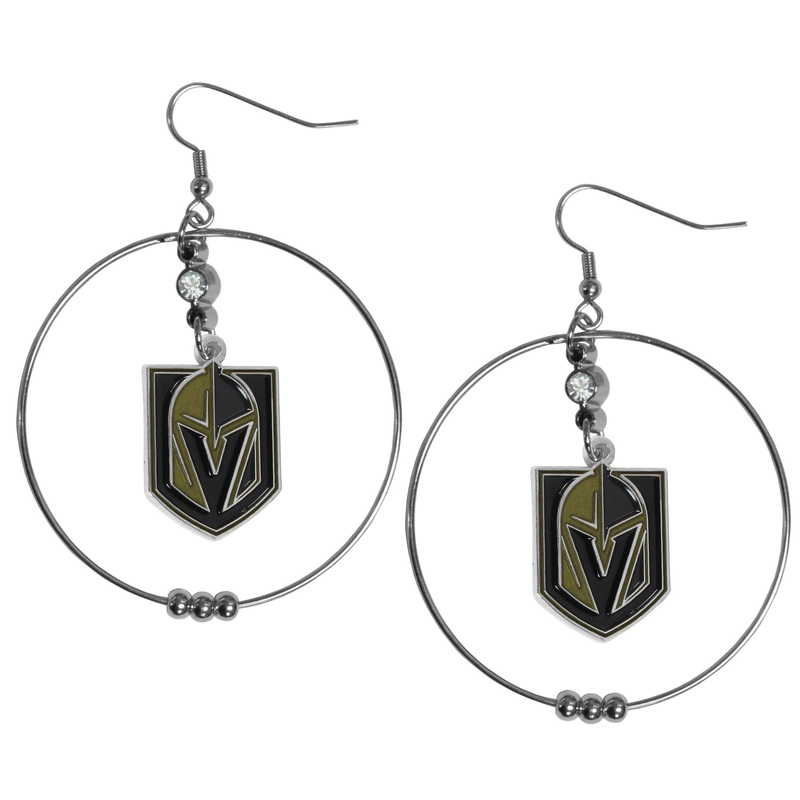 The earrings are approximately 1.5 inches long and feature an iridescent crystal bead and nickel free chrome Las Vegas Golden Knights® charm on nickel free, hypoallergenic fishhook posts. Our officially licensed fine grain leather wallet features numerous card slots, windowed ID slots, removable picture slots and large billfold pockets. 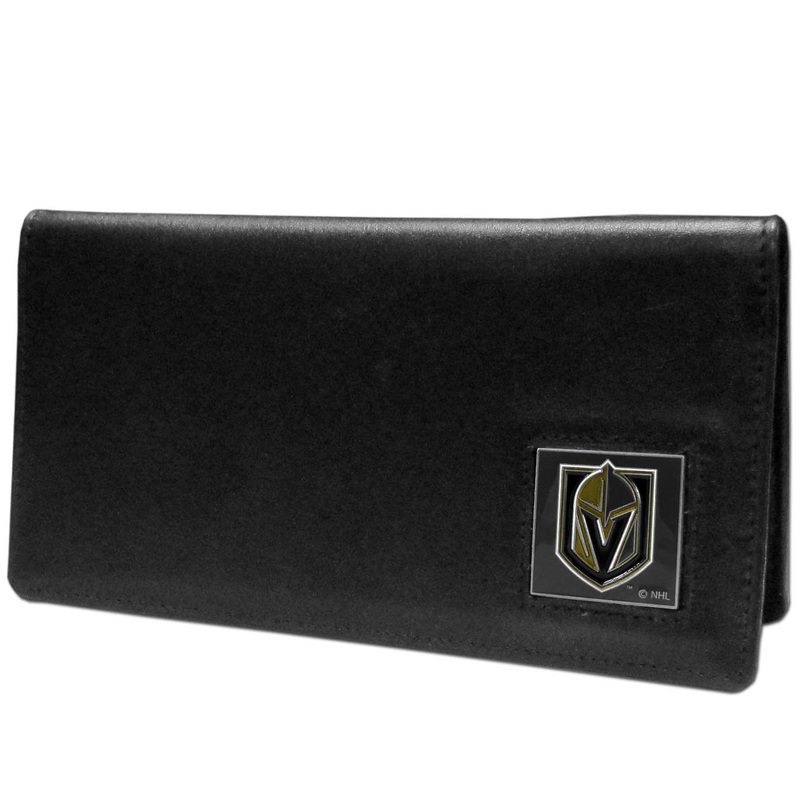 This quality wallet has an enameled Las Vegas Golden Knights® emblem on the front of the wallet making it a stylish way to show off your team pride. 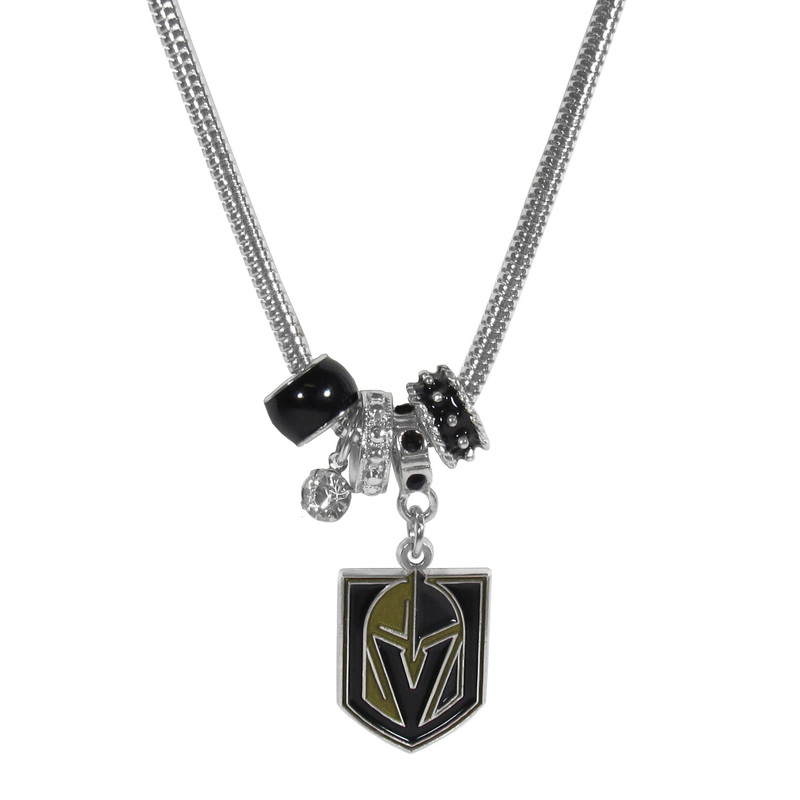 We have combined the wildly popular Euro style beads with your favorite team to create our Las Vegas Golden Knights® bead necklace. The 18 inch snake chain features 4 Euro beads with enameled team colors and rhinestone accents with a high polish, nickel free charm and rhinestone charm. Perfect way to show off your team pride. 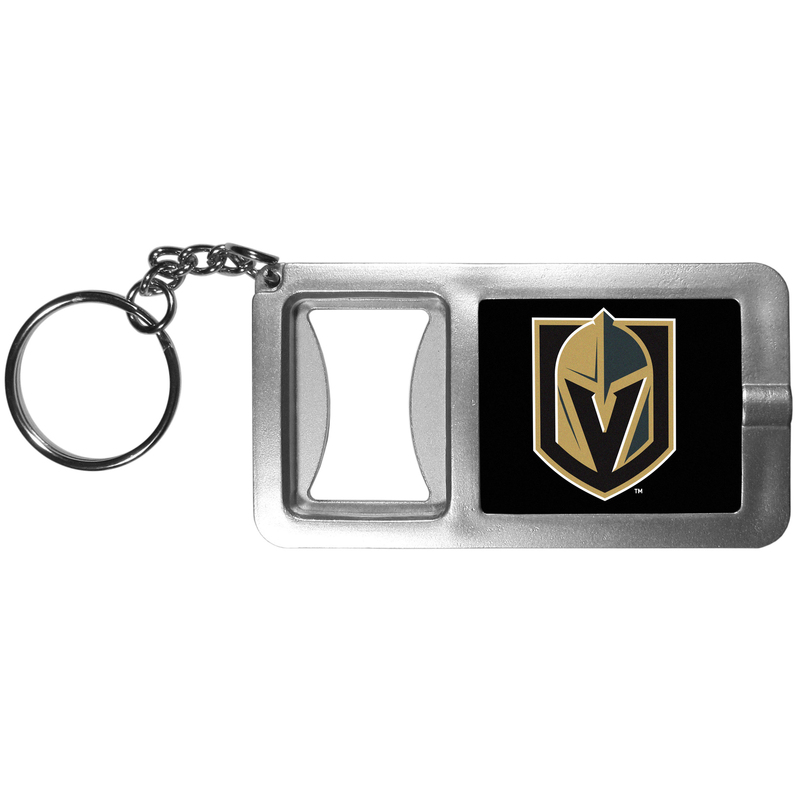 Never be without light with our Las Vegas Golden Knights® flashlight keychain that features a handy bottle opener feature. This versatile key chain is perfect for camping and travel and is a great way to show off your team pride! 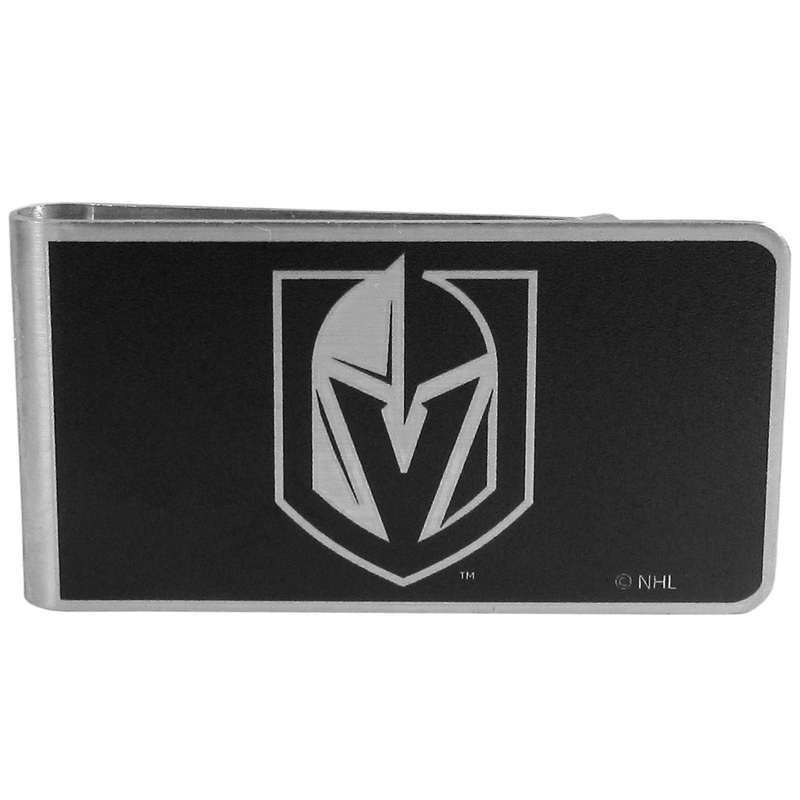 Whether you are caravaning to the game or having a tailgate party make sure you car is wearing its fan gear with our extra large, 11 inch Las Vegas Golden Knights® home state magnets. These striking magnets can be easily placed on for game day and removed without he residue left by decals. The design features a bright state outline with the location of the team highlighted with a football and a large team logo. It's a home state decal with a sporty twist! 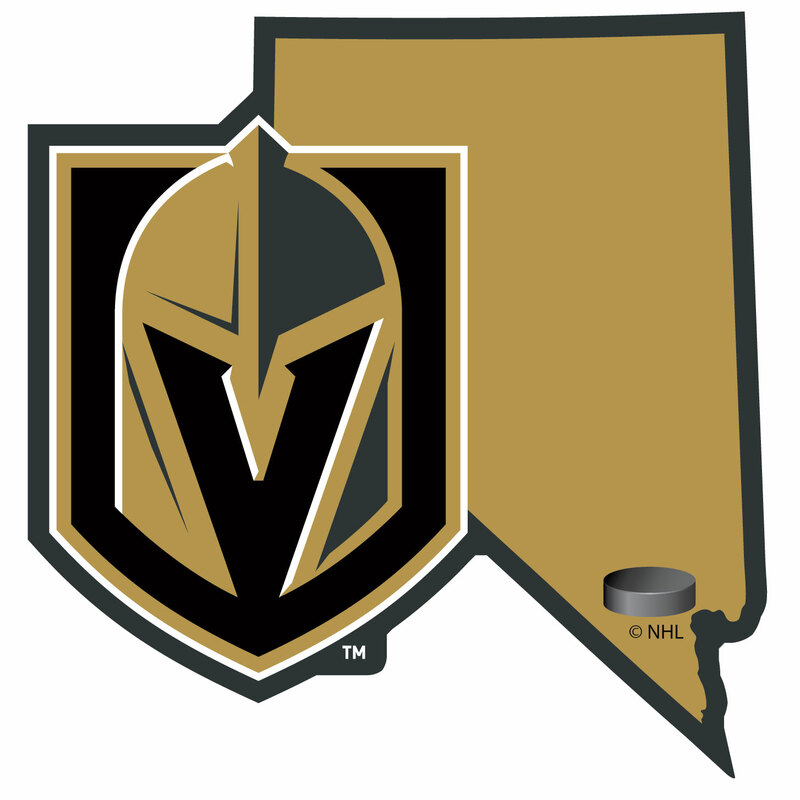 This Las Vegas Golden Knights® decal feature the team logo over a silhouette of the state in team colors and a heart marking the home of the team. The decal is approximately 5 inches on repositionable vinyl. 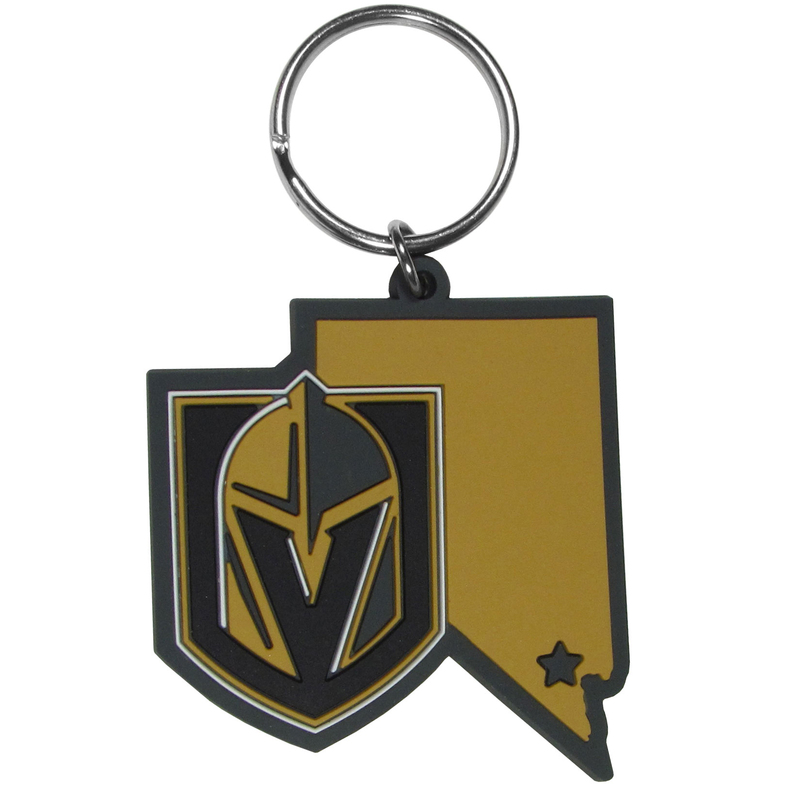 Our flexible Las Vegas Golden Knights® key chains are a fun way to carry your team with you. The pliable rubber material is extremely durable and is the layered colors add a great 3D look to the key chain. This is really where quality and a great price meet to create a true fan favorite. Our officially licensed fine grain leather bi-fold wallet features numerous card slots, large billfold pocket and flip up window ID slot. 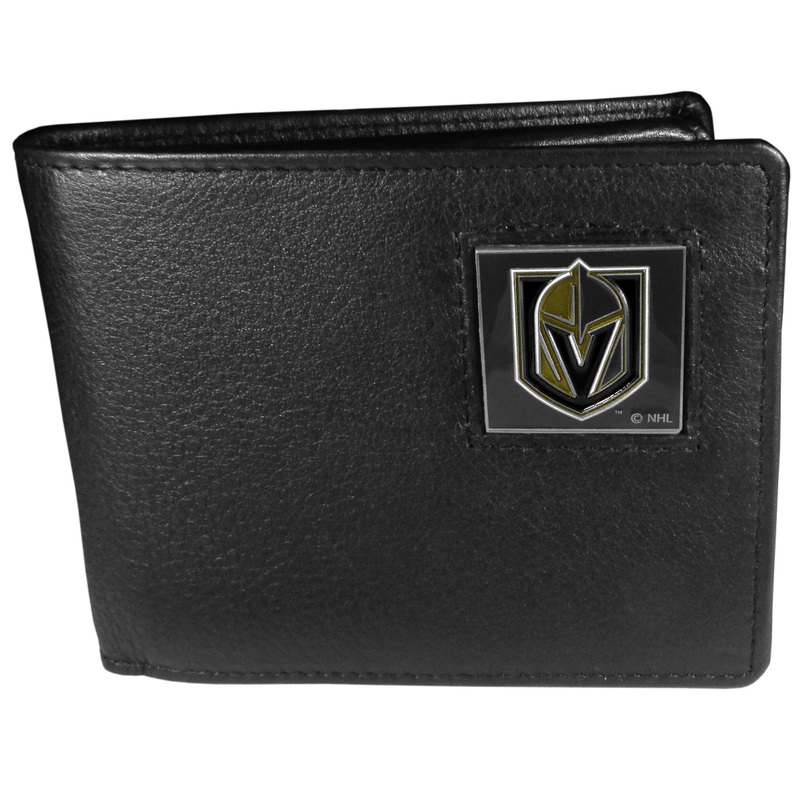 This quality wallet has an enameled Las Vegas Golden Knights® emblem on the front of the wallet. 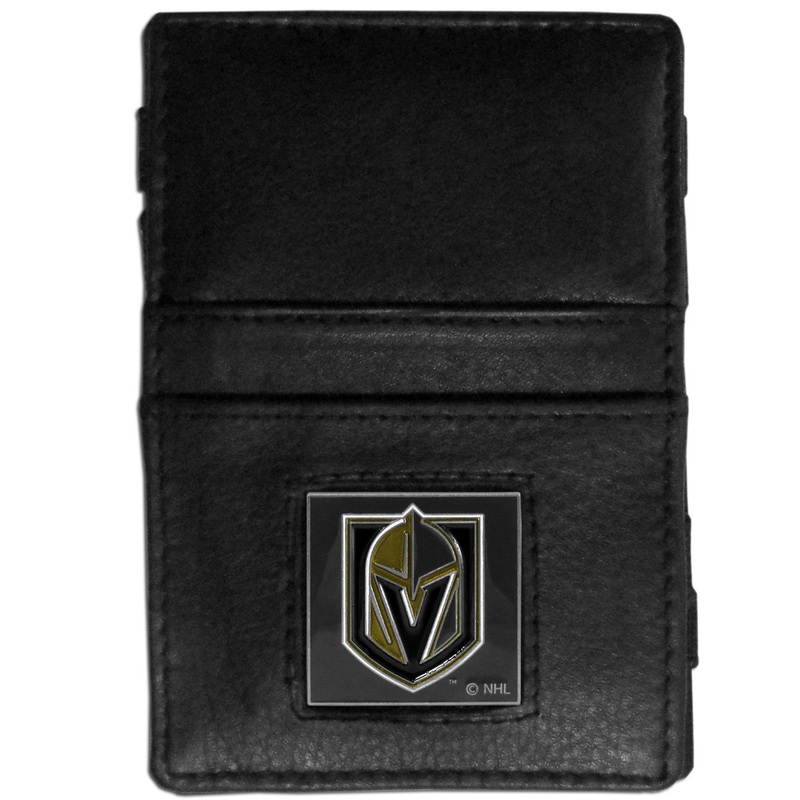 Our officially licensed checkbook covers is made of fine grain leather and features a fully cast and enameled Las Vegas Golden Knights® emblem. The cover works for both top and side loaded checks and has a plastic sleeve for duplicate check writing. This officially licensed, innovative jacob's ladder wallet design traps cash with just a simple flip of the wallet! There are also outer pockets to store your ID and credit cards. 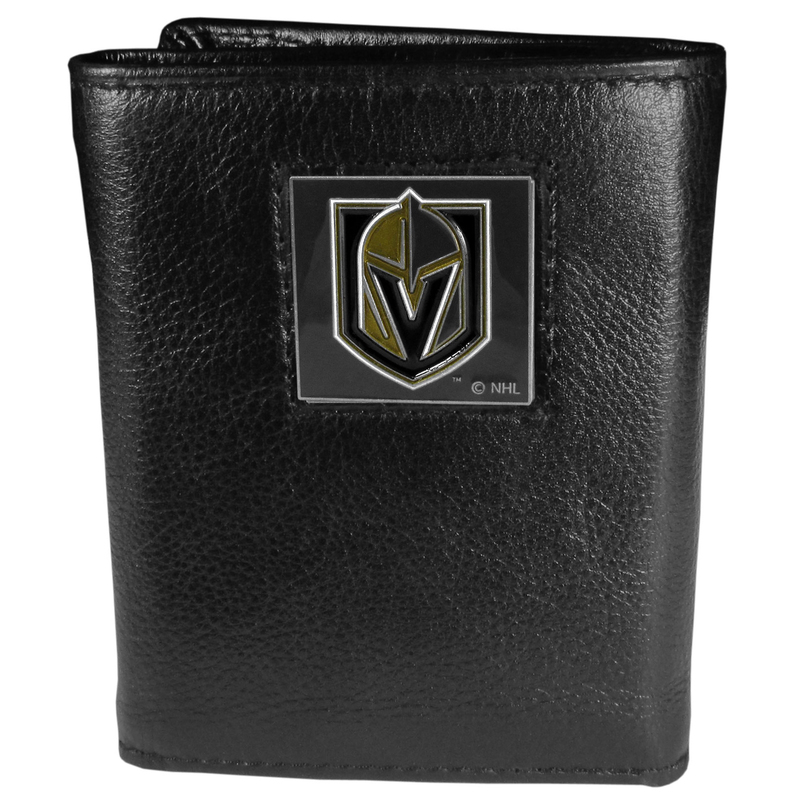 The wallet is made of fine quality leather with a fully cast & enameled Las Vegas Golden Knights® emblem on the front. Our officially licensed Money Clip/Card Holders won't make you choose between paper or plastic because they stow both easily. 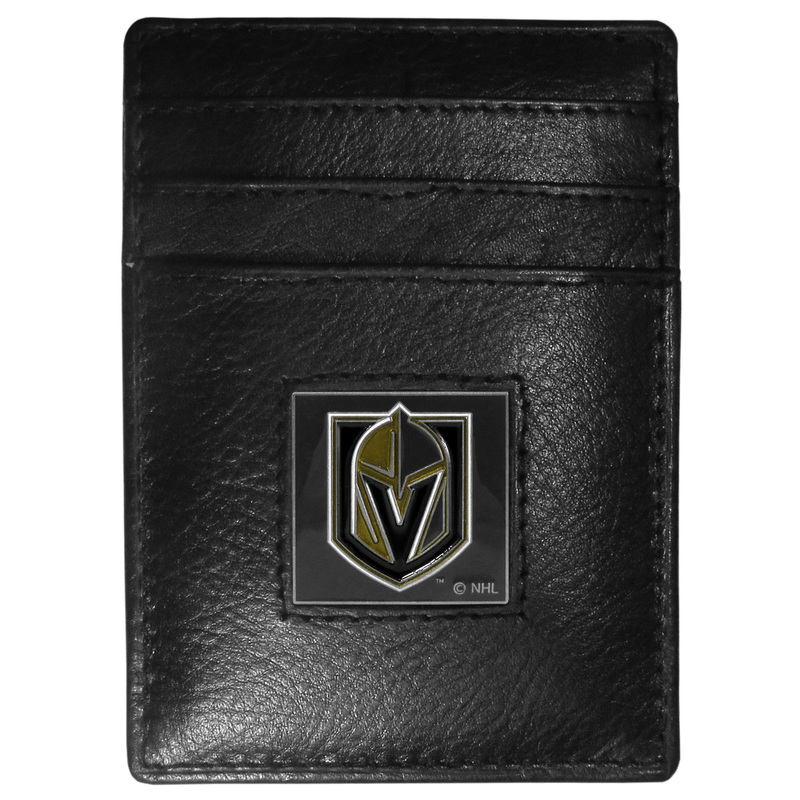 Features our sculpted and enameled Las Vegas Golden Knights® emblem on the front of the wallet. This heavy-duty steel opener is extra long, with a durable vinyl covering. 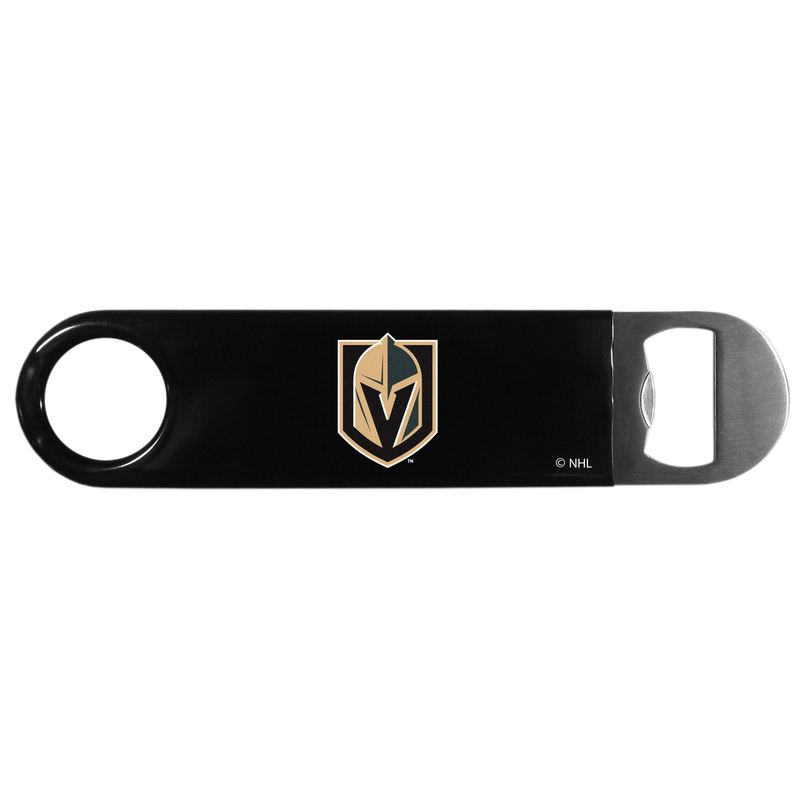 The extra length provides more leverage for speed opening and the opener features a large printed Las Vegas Golden Knights® logo. 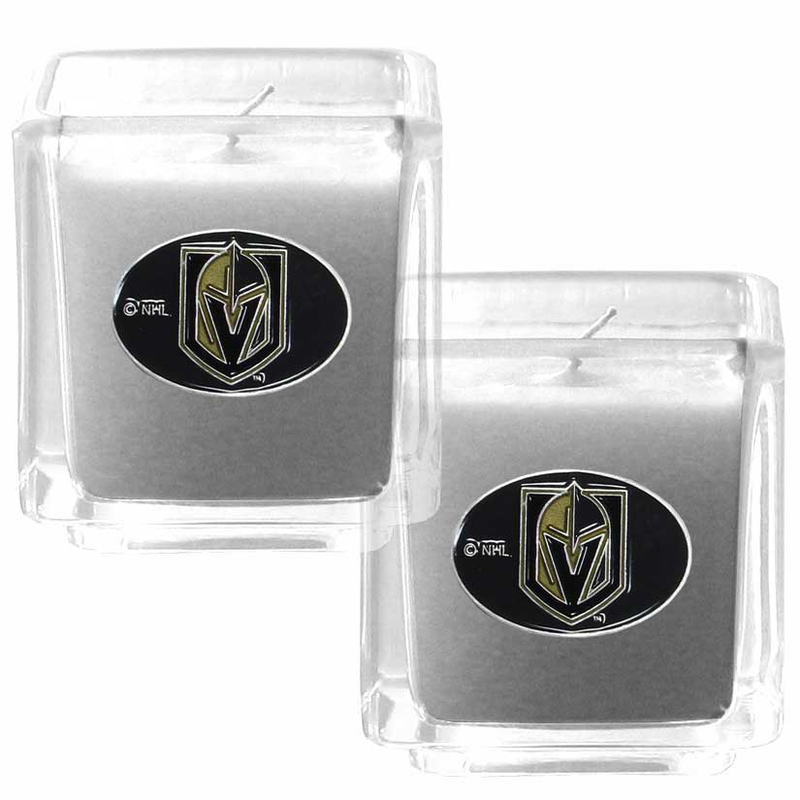 Our candle set features 2 lightly vanilla scented candles with fully cast metal Las Vegas Golden Knights® emblems that have an enameled team color finish. 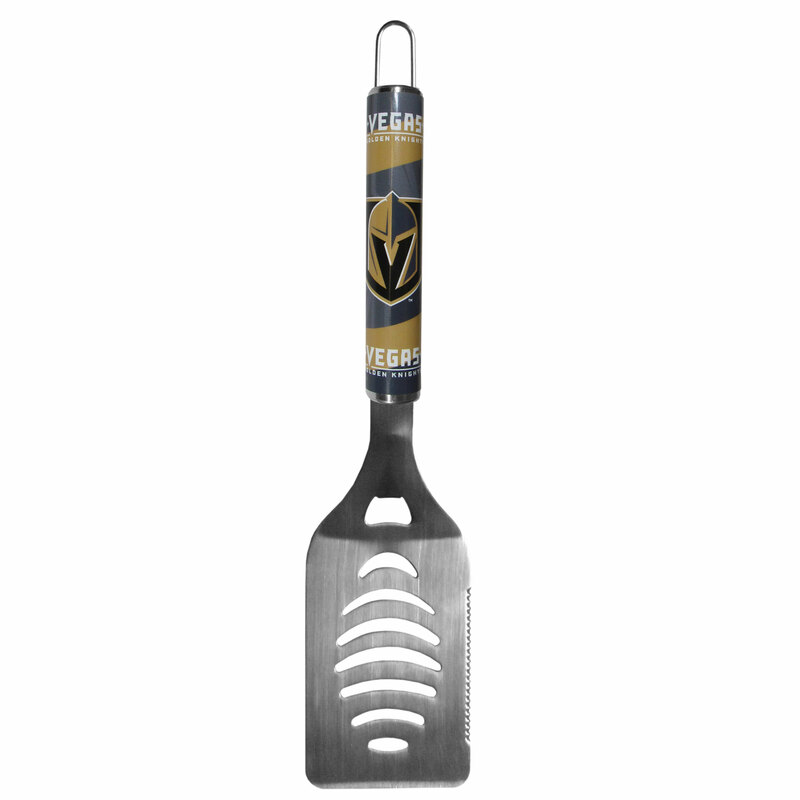 Our tailgater spatula really catches your eye with flashy chrome accents and vivid Las Vegas Golden Knights® digital graphics. The 420 grade stainless steel spatula is a tough, heavy-duty tool that will last through years of tailgating fun. The spatula features a bottle opener and sharp serrated edge.